Pictured below are photos of selected Towing System Products. On the left is a Towbar which is adjustable for length and width to allow the Towed Vehicle to be driven up close to the rear of the towing RV and then the arms of the tow bar can be extended and moved to fit on the towing baseplate "tabs". On the right is a baseplate which is bolted to the Towed Vehicle's "frame". The forward facing protrusions on either side accept the two light colored metal towing tabs, shown on the left side in this photo. The two protrusions with holes in them are where the safety cables are connected. The two pins in the middle support the wiring connector which holds the wiring from the rear area of the towed vehicle's tail lights. The two "permanent" safety cables with the rings on either end are installed around the bar of the baseplate and around a frame cross member. Should the bolts securing the baseplate to the Towed Vehicle come loose or disappear, then these cables will hold the baseplate in the area of the frame providing a safe connection to retain the safety cables in the event that the baseplate comes loose. This photo shows a number of towing accessories. 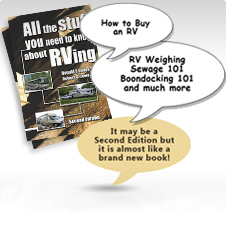 At the top is a towbar cover that protects the tow bar when it is on the back of the RV and not being used. On the next row there are two safety cables with 'S' Hooks and rubber retainers that are rated at 5,000lbs. The heavier (10,000lb rated) safety cables use a formed metal hook with a latch. The coiled blue cable extension in the middle of this photo provides the electrical connection between the RV and the Towed Vehicle. The two black connectors are included with the cable extension although the RV most often has a suitable connector which may require an adapter. One the lower left is a Diode Wiring Kit which is used to connect power from the RV to the towed vehicle's existing tail lights. In the lower center is the 'Bulb and Socket' wiring kit. This kit is used when an extra bulb can be fitted into the tail light housing of the towed vehicle and it is powered solely by the RV. The locks on the lower right allow the tow bar to be locked to the RV and the tow car. This photo shows a selection of Drop/Rise receivers which are utilized to bring the towbar closer to level. They can be inserted to drop the towbar closer to the ground or inserted in the opposite direction to raise the towbar above the height of the RV's hitch receiver.